Strange “frozen waves” near the second crater in 2-foot-thick ice, this one at Powderhorn Lake, photogaphed by cabin owner Peter Butler on Sunday, March 10, 2013. 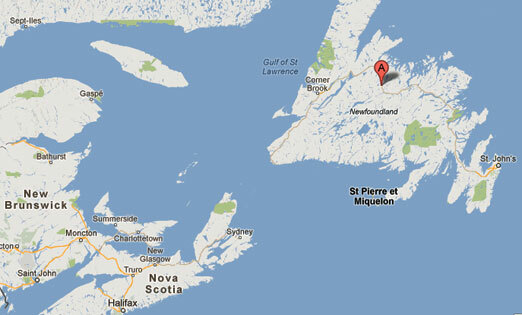 Dawes Pond and Powerhorn Lake are about four miles apart at the Google map pointer near Badger, Newfoundland, Canada. March 13, 2013 Dawes Pond and Powderhorn Lake, Badger, central Newfoundland, Canada - Two mysterious ice craters surrounded by odd, rising ice patterns that resemble frozen waves have been reported by cabin owners living about four miles apart, one on Dawes Pond and the second on Powderhorn Lake - both near Badger, Newfoundland, Canada.